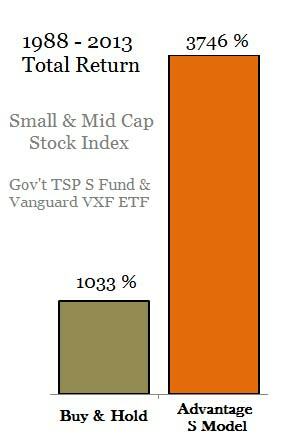 The TSP C fund has outperformed the other funds so far in 2014 while the TSP S fund has been the top performer since the 2007 market peak. The TSP S fund’s up trend broke down in April and has been trading sideways throughout the summer. This month the TSP C fund ended its uptrend established since early 2013, and both fund’s recent dip was lower than the last. The question on every investor’s mind should be, “is a market top in progress?” And if so, how to invest for the bear market. The current shift in performance in TSP equity funds may be a repeat of the 2000 and 2007 market tops as money shifted from the small capitalization stocks to the safer larger companies. We charted the indexes tracked by the TSP funds prior to the publishing of the daily TSP prices to see how they would have performed at the last two market peaks. We noticed the TSP S Fund (small & mid cap stocks) peaked first, corrected and rallied to a lower high as the TSP C fund (large cap stocks) hit its peak. In 2000, the TSP S Fund tracked index peaked in March, corrected and had a failed rally in July as the TSP C fund index put in a double top. In 2007, the small capitalization stocks as represented by the Russell 2000 index peaked in July, corrected and failed to establish a new high as the TSP C fund peaked. Today, we are seeing the same pattern develop with the TSP C Fund establishing a new high while the small capitalization stocks (Russell 2000) fail to. This pattern alone is not confirmation a top is forming, but it does support other indications. From a risk mitigation point-of-view, if a market top is in progress the larger capitalization stocks tend to perform the best or lose the least initially until a bear market is confirmed. We are entering the strongest time frame for equities in the four year election cycle historically. Our models show you would have a 16-0 record if you invested in late October looking back 16 election cycles. This is a political-fiscal cycle where by incumbents provide fiscal stimulus to the economy in order to run for re-election with the backdrop of a strong economy (and stock market). Yet, we wonder if the federal reserve’s quantitative easing (easy money) policies have trumped this cycle with the recent run-up in stocks. We are in bear hunting mode, making sure we see the bear coming in order to take proper action. The focus of TSP Smart Investor over the coming months will be on determining if a bear market is upon us.